The valvetrain is one of the most critical components in any engine build, be it stock or performance. The lifters, pushrods, rockers and springs must all be strong and stiff enough to handle the loads and RPMs the engine will encounter, and they have to be durable enough to go the distance whether it is on the street or the race track. Stock valvetrain components are designed for stock applications and stock builds. For most applications, that means the engine will spend most of its time at low speed and light load, and not be revved beyond the factory redline (typically 6,000 to 6,500 RPM). So when you start modifying things, the dynamics change. Install a hotter cam with more lift and duration for more power, and you also have to upgrade the valve springs and pushrods to handle the higher engine speeds and loads. 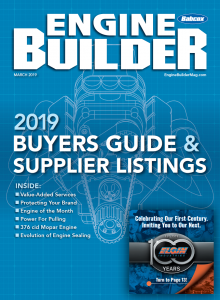 As RPMs go up, so does the need for stiffer valve springs, stiffer pushrods and lighter valvetrain components (valves, retainers and rockers). If you have ever watched a YouTube video of pushrods under load at high engine speed, you know how much they wobble and flex. That’s not good for valvetrain stability, valve timing or consistent power. Increasing the diameter and/or wall thickness of the pushrods makes them stronger and stiffer and much more stable. Increasing the stiffness of the pushrods has allowed engine builders to use more aggressive cam profiles with more lift and/or duration. According to one major camshaft supplier, pushrod deflection can reduce cam duration as much as 20 degrees at higher engine speeds causing a measurable loss of power. Even at lower RPMs, pushrod deflection may reduce cam duration 5 to 10 degrees. Stiffening up the pushrods can help regain lost power while reducing the risk of bending pushrods. 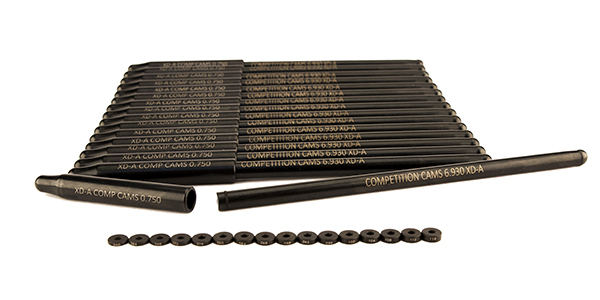 As some engine builders have discovered, increasing the stiffness of the pushrods has allowed them to use more aggressive cam profiles with more lift and/or duration. The same thing can happen with valve springs. Conventional single coil valve springs can quiver like gelatin as a result of harmonics that come and go at various engine speeds. Dual and triple springs are more stable because the spring diameters are different, so their harmonics are different. Even so, valve control and valvetrain stability can suffer at high RPM depending on how the harmonics between the springs interact. Beehive and conical valve springs, by comparison, are typically more stable and experience fewer harmonics because of the way these springs are designed. The upper coils are smaller in diameter than the lower coils, so the different sections of the spring resonate at different frequencies. The result is a more stable spring and more RPM potential with less spring tension and less strain on the valvetrain, lifters and cam. Double conical springs are also available for higher RPM applications, and for those who want the added insurance that double springs offer. If one spring breaks, the second spring prevents the valve from being sucked into the combustion chamber. Valve spring durability and longevity is always a concern in a performance engine. 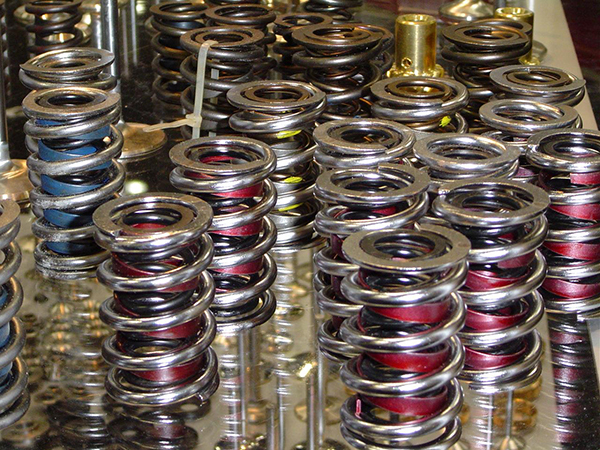 Higher speeds and loads take a toll on the valve springs, and over time the springs will weaken and lose tension. The greatest danger is spring failure, which usually starts at a microscopic level due to tiny imperfections in the metallurgy of the spring wire. High quality wire as well as how the springs are manufactured, heat treated (including cryogenic treatments), peened and finished make a big difference in how long a set of springs will retain their spring rate and last in a motor. The best spring wire reportedly comes from Japan and Austria, and the harder the steel the better according to those who make racing springs. How much spring tension does an engine really need to maintain good valvetrain control? The answer is just enough to maintain valve control within the engine’s RPM range. Stiffer springs increase friction and resistance as well as the load on the rockers, pushrods, lifters and cam lobes. The springs have to be stiff enough to prevent valve float, and to prevent the valves from bouncing when they close, but no stiffer than that. Using overly stiff springs wastes power, puts added stress on the valvetrain and increases the risk of valvetrain failure. Valve spring durability and longevity is always a concern in a performance engine. Higher speeds and loads take a toll on the valve springs, and over time the springs will weaken and lose tension. Single springs with 80 to 90 lbs. of seat pressure are usually good enough for a typical SB Chevy street performance engine with a flat tappet .450˝ lift cam. For a higher revving street/strip engine with a flat tappet cam, single springs with 100 to 120 lbs. of seat will usually suffice, or 105 to 140 lb. springs for a hydraulic roller cam. On late-model Chevy LS engines, the stock valve springs only have 105 lbs. of seat pressure when closed, and 290 to 300 lbs. open. Many ProStock drag motors, by comparison, run double or triple springs with closed seat pressures of 400 to 500 lbs., and open pressures in the 1350 to 1450 lb. range to handle 10,000 RPM engine speeds. The best advice when choosing valve springs is to follow the recommendations of your cam supplier. All the motion in the valvetrain starts and ends with the camshaft. In pushrod engines, the rotation of the cam lobes under the lifters actuates the valvetrain. The highest pressure loads and friction that occur inside a pushrod engine occur where the lifters contact the cam lobes. Flat tappet cams are the worst, so upgrading to a roller cam and lifters can significantly reduce friction while increasing usable horsepower at the flywheel. Roller lifters can also handle more aggressive cam lobes (steeper and faster opening ramps) than flat tappet cams, which is also good for more power. To maximize the reduction in friction, the roller wheel on the bottom of the lifter has to keep up with the rotation of the cam. Needle bearings spaced around the inside of the roller allow it to spin freely and follow the cam. The reduction in friction may be good for 20 to 30 or more horsepower at the flywheel. However, if the rollers can’t keep up with the cam, the lifters will act more like flat tappet lifters and drag increasing friction and wear. In recent years several aftermarket valvetrain manufacturers have introduced bushing style rollers as an alternative to needle bearing roller lifters. With needle bearing rollers, valvetrain loads are concentrated on only a few relatively small diameter needle bearings. If the engine has extremely stiff dual or triple valve springs, it may overload the needle bearings and shorten the life of the lifters. Replacing the individual needle bearings with a single large bushing spreads the load over a much broader surface, allowing the lifter to handle higher loads. 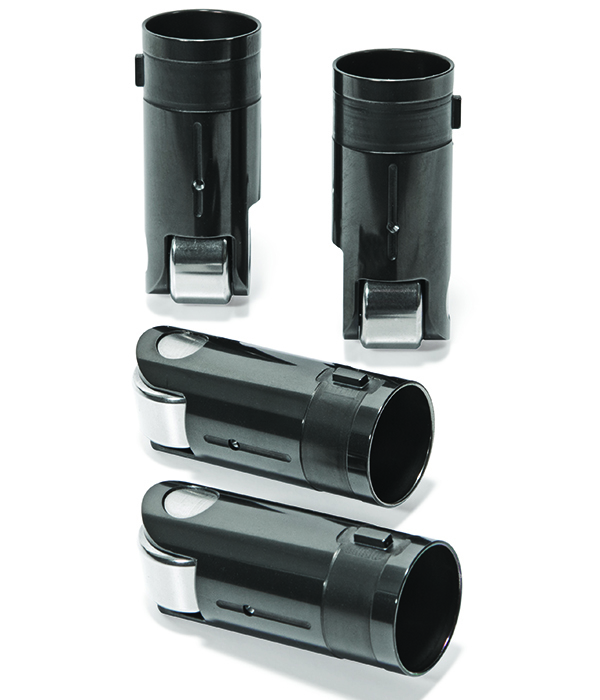 The bushing style rollers are intended for racing rather than street use. However, bushing style rollers do require more oil flow than needle bearings to maintain the oil film in the roller bushing. If it fails to receive enough oil, the roller may not spin freely or fast enough to keep up with the cam, causing it to drag and wear the opening ramp on the cam lobe. A representative of a manufacturer we interviewed for this article that makes both styles of roller lifters said needle bearings are very reliable and failures are relatively uncommon. 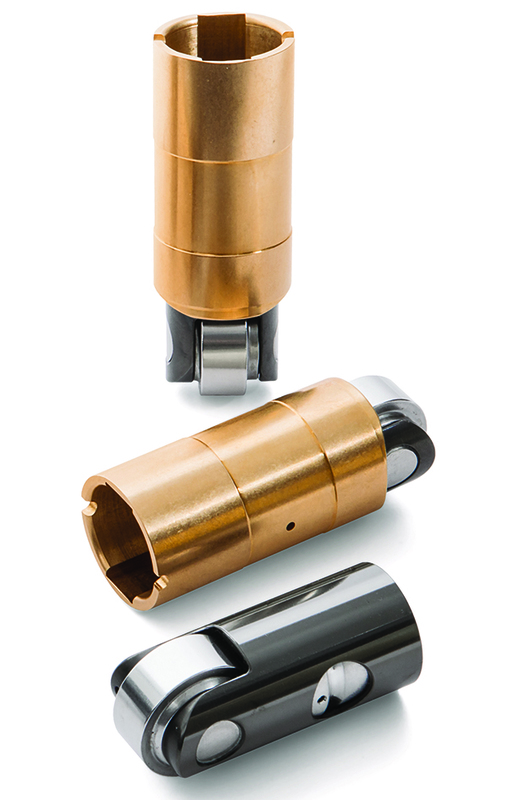 But the company has seen instances where some bushing style rollers have caused cam wear problems. There is also a trend to larger diameter rollers. The larger the roller on the bottom of the lifter, the broader the area of contact between the roller and cam. This helps to distribute loads across a larger area while also allowing the use of more aggressive cam lobes to open and close the valves faster for a given lift and duration. One thing all types of roller lifters require is a mechanism to keep the rollers in alignment with the cam. If a roller lifter twists in its bore, the roller will drag rather than spin. A tie-bar link placed between adjacent lifters is commonly used to keep the rollers straight. But the tie-bar adds weight because the lifter body has to be somewhat taller to attach the linkage. And if the tie-bar fails, you lose alignment. Various types of roller alignment systems have been introduced to eliminate the tie-bar between adjacent lifters. Some use a tool steel keyway to align the lifters in their bores, while others use a “roller guided system” with a special lifter bore bushing. In recent years, various types of roller alignment systems have been introduced to eliminate the tie-bar between adjacent lifters. Some use a tool steel keyway to align the lifters in their bores, while others use a “roller guided system” with a special lifter bore bushing that aligns the roller to prevent the lifters from twisting. The use of shorter lifters without tie-bars also eliminates interference problems if larger diameter pushrods are used. As for flat tappet lifters and cams, lubrication is always a concern – especially with today’s motor oils that contain much less ZDDP anti-wear additive. ZDDP has been reduced in motor oils because zinc and phosphorus can shorten the life of catalytic converters, especially if an engine is burning oil. Late model engines with roller lifters do not require as much ZDDP anti-wear additive as older engines with flat tappet cams, so they can usually get by with off-the-shelf conventional or synthetic motor oils. But older engines with high friction flat tappet cams have experience cam and lifter failures when run on low ZDDP oils. Cam and lifter failures are more of a concern with modified engines that have hotter cams and stiffer valve springs than stock engines. So for these kind of applications, be sure to use a ZDDP supplement or a specially formulated racing oil or street performance oil that contains extra ZDDP for wear protection. To reduce the risk of cam and lifter failures, some aftermarket cam manufacturers have upgraded to harder cast iron alloys and better heat treatments, or even tool steel cores for added durability. Some lifter manufacturers have also added a small pinhole in the bottom of their lifters to route oil directly to the cam lobe, or machined several small flats down the sides of the lifter body so more oil will flow down the lifter bore to the cam lobe. As we mentioned earlier in this article, stiffer stronger pushrods are a must for all performance applications due to higher engine speeds and valvetrain loads. Pushrod manufacturers use a number of techniques to increase strength and stiffness including stronger allows (such as chrome moly), thicker wall tubing and larger diameter tubing. Some even use a tube-within-a-tube design to add stiffness to their pushrods. Larger diameter pushrods always improve valvetrain stability, but there is often a limit as to how large the pushrods can be before they run into interference problems. Cylinder heads with large intake ports may limit the size of the pushrods. Larger diameter and thicker pushrods do add weight to the valvetrain, but weight on the pushrod side of the rockers has much less effect than weight on the valve side of the rockers. The lift ratio of the rocker multiplies the force of the spring as it pushes back against the rocker as the valve closes. The up-and-down motion and distance traveled on the valve side of the rocker is also much greater than on the lifter and pushrod side of the rocker. So it is better to reduce weight on the valve side of the rocker with lighter beehive or conical springs and lightweight spring retainers than to worry about adding weight on the pushrod side with thicker, heavier pushrods. Pushrod length is another factor that must be right for proper rocker arm geometry. The tip of the rocker arm should be centered over the valve stem when the rocker is at half lift, otherwise it will exert too much side thrust against the valve which can result in increased friction and valve guide wear. To maximize reduction in friction, the roller wheel on the bottom of the lifter has to keep up with the rotation of the cam. Needle bearings spaced around the inside of the roller allow it to spin freely and follow the cam. Stock length pushrods only fit stock engines that have their original unmilled cylinder heads, blocks with stock deck heights, stock installed valve heights, stock valve lengths and stock rocker arms. Temperature also affects the length of the pushrods as well as valve lash in the engine itself. Change any of these variables and it alters valvetrain geometry and the required length of the pushrods. Pushrod length can be determined with an adjustable pushrod. After assembling the engine, the pushrod is inserted between the lifter and rocker. The length of the pushrod is then adjusted until the correct rocker arm-to-valve geometry is achieved. Once you know the length that is required, you can order the pushrods for the engine. They might be off-the-shelf pushrods that are stocked in various sizes or custom made-to-order pushrods if a special length is required. The newest development in pushrod sizing are “adjustable” length pushrods that can be select fit to the engine application. The first of these new adjustable pushrods are for Chevy LS applications with hydraulic lifters, although more applications are coming soon. The adjustable pushrods are a two-piece design, with a smaller diameter upper tube that slides into a larger diameter lower tube. Small shims of various thicknesses can be inserted between the upper and lower tubes to change the overall length of the pushrod and to adjust lifter preload. Valve spring tension holds the upper and lower sections together and prevents the pushrod from pulling apart. It’s a really slick solution to the age-old problem of getting the right pushrod length. Another advantage with the new adjustable length pushrods is that you can use rocker arms without adjuster screws to save weight. Taking weight out of the rockers reduces strain on the valvetrain and improves stability.